First of all, Winterval Advent starts the day after Thanksgiving and HATS ON. This is Odie's first Winterval, he is super excited. 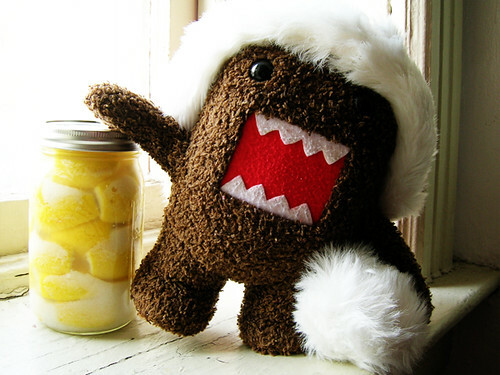 And he helped make these preserved lemons! We might have done this wrong, we'll find out in four weeks! Most of the instructions say to quarter the lemons lengthwise but not all the way through, so the lemons stay whole and you can pack the salt inside. I cut them into sixths because I thought I could pack them tighter, and just rolled the wedges in salt, but it looks like the salt just drifts to the bottom of the jar like that. I did just fit six lemons into a quart mason jar, and topped it off with the juice of the seventh and eighth lemons. Put a couple tablespoons of salt in the bottom of a quart-sized mason jar. Okay so, this is how I did and I will edit later if it doesn't turn out: trim the ends off six lemons and cut them lengthwise into sixths. Pour a good amount of salt in a small bowl, press the salt into the lemon wedges all over, and pack them tightly in the jar. Squeeze the last two lemons and top the jar all the way up with the juice. Top with a couple more tablespoons of salt. Now they're supposed to sit at room temperature for a couple days, turning the jar upside down now and again. Then they go in refrigerator for at least three weeks, still turning them upside down now and again, until the lemon rinds soften. When they're ready, you take a lemon out of the jar, rinse off the salt, chop it up and add it to stuff. I am planning to use these for slow chicken, stay tuned.